Here I am in my heated cat cup, on my Barcelona chair because I prefer not to sleep on the ground. And for added warmth, I am covered in a blanket! Can you see my toybox in the background? When I get a little bit too warm, I just stick my arms out. My Mommeh calls this my Supercat pose. Even though I cannot really fly. Goodnight, everybuddy! Even Supercat has to sleep sometime. OMC, Daisy, you just have the most amazing life! But I can't exactly be envious because so do I! Except Binga is the one who gets to be Supercat around here. I only get to be "show kitty" when my human carries me around the house. I do the supercat pose too Daisy! Miss D, we think you are the superest cat in the world, and very cute flying in your cat cup. smooches to you sweet girl. MOL! Daisy you look great! That looks so very cozy, Super Daisy! That is so cute! I didn't think you would need that being in Florida. When I put my arms out like that, mommeh runs for that silly box and keeps saying how sweet I look. What is it about my arms that makes her so happy? I never tried to fly but I will try hard next time. I think I CAN fly, Daisy. If I do, I will fly to see you and Harley! I want to see what's in your toy box! You are a lucky duck, Miss Daisy! What a wonderful set up. You look so warm and snuggly and cozy. Are you sure you can't fly, Daisy? We think you could if you really wanted to! The mom says what a great chair! Daisy, that is just too cute! Let's call that the Supercute Pose! WOW, Daisy, you DO look like Super Cat!! You are lucky to have all that warm snuggly stuff to keep you toasty. We have a fireplace that I turn on just for the kitties. When Hobbes gets too hot in his basket by the fire, he sort of "pours" out onto the cool wood floor. What lucky kitties we have! Hee hee! You do look like you're flying, Daisy :). Sweet dreams! Daisy, that does look so nice and warm with that especially nice blanket. We love how you play like supercat. Gotta keep those front arms cool. You are a cool kitty anyway. Take care. You really are a Supercat!! You are Supercat! Don't believe the stories that you aren't. oh how cute and toasty!!! We love your superlady pose Daisy and it pays to be cute too! Well aren't you just the one! the life of Riley! You are so lucky to have that heated cat cup! Your Mummy is so good. 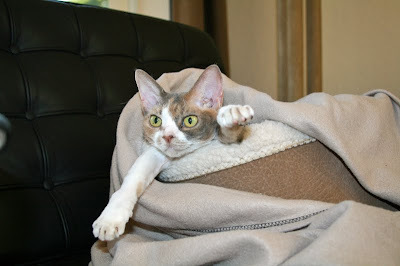 We love that Supercat pose, Keiko likes to do it on the back of the couch too! Oooh, a heated cat cup sounds comfy. Are you sure you can't fly, Daisy? 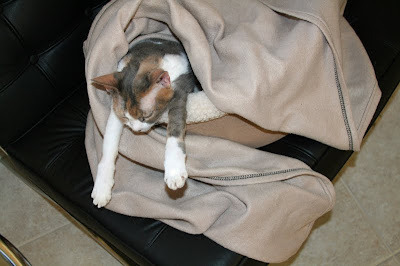 Nighty-night supercat!!! Have some super dreams! Daisy, you have a very cozy bed to sleep in! Your supercat pose is very cute too! Daisy you are just too cute! 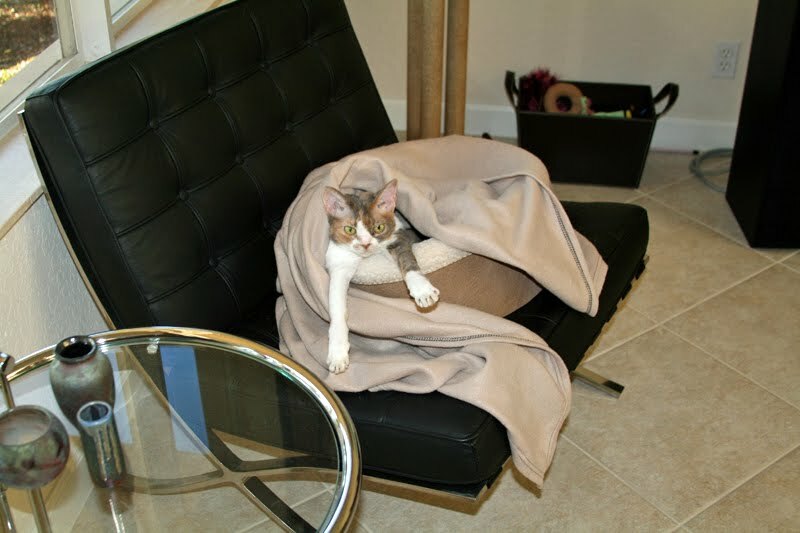 Our kitties would surely love to have as comfy a spot as you do! Oh Daisy, you look perfectly comfy. How lucky are you SuperCat? I'll bet the kitties at "Purrchance to Dream" could tell you stories about snowstorms lat lasted for days Daisy...lucky you are a Florida cat! I like to do that too Daisy! Daisy, we think you could fly in your dreams! We think it's great how you get an entire chair all to yourself. You are a super cat in more ways than one! Daisy, that looks like the purrfect napping spot! Is there room for us?? Wowie!!! We just love your Supercat pose Daisy!! And your toy box looks like it is filled with lots of cool stuff!! That's some pose you have there Daisy, that's just too funny. I must say it doesn't look very comfortable though. Hi Daisy! We love your supercat pose! We sleep that way sometimes too - it is nice and refreshing for sure! We like your chair too - mom was looking at those when she was looking for new couches but since it didn't have a couch it got a no. Daisy dear, tuck your paws in so they don't get cold while you're sleeping! That looks like a very good place for Supercat to sleep! Miss Daisy, you look super cute sleeping with your arms all stretched out! Our mom needs to buy us some heated cat cups. She's worried that she'll forget to turn them off when she's gone and burn the house down, though. What a comfy setup and on the internationally classically stylish Barcelona chair, no less! You are one tres chic kitty! Thanks for sending paw power to my sister, Puff. You look very warm and cosy in there Daisy. I stretch my arms out like that when I am hot too. You look so cute in a blanket! You do look like a supercat with your arms out :-) I hope you have a good dream...maybe flying in a dream? You look soooo comfy there! Yes. You need to enjoy your naps! I think I will likes to go under mine blanket sometime too! But I will has to be a superdog! Daisy looks very cute snuggled up in her blanket. Awwww.... that's looks soooo comfy! Wish I had one of those! You are so adorable with your supercat pose, Daisy! !